Democratic Sen. Bill Nelson has conceded Florida’s Senate race to his Republican opponent Gov. Rick Scott following a hand recount. While there is a run-off still to come in Mississippi, the Scott win makes it most likely the Senate Republicans will hold a 53-47 majority in the 116th Congress. Much of the Florida suspense was, predictably, in Broward County, where the vote counting was rather slow and deliberate and a pattern of under votes in the Senate contest emerged. But as county officials worked through the hand recount ordered after the margin was within 0.15 percent statewide, it was clear Nelson couldn’t make up the deficit. The race was the most expensive Senate contest in the Sunshine State’s history. On election night, Scott came out to greet supporters in a resort ballroom in Naples shortly before midnight, and he declared victory even though Nelson had not conceded and the Associated Press had not yet called the race. As it turned out, the nastiness was not quite over, with the two campaigns and their supporters continuing to trade barbs and accuse each other of trying to steal the election. Scott came to Capitol Hill to participate in post-election activities of the Republican Conference, including leadership elections. And his campaign took to referring to the outgoing governor as the incoming junior senator. Nelson and other Democrats, led by Minority Leader Charles E. Schumer of New York, had been optimistic about the hand recount showing a different result. But, that was not the case. Schumer and Nelson had called for Scott to step aside from any role in overseeing the recount. “Gov. Scott needs to recuse himself from any involvement in the recount, and do it now. He’s a contestant in this election and can’t possibly be trusted to be a neutral, fair arbiter as the votes are tallied,” Schumer said Tuesday. Nelson went into Election Day with a slight lead in polling, with the conventional wisdom being that he was being boosted by enthusiasm for Democratic gubernatorial nominee Andrew Gillum. Gillum, it turned out, did not have the coattails. Former Republican Rep. Ron DeSantis, a prominent ally of President Donald Trump, was deemed the winner of the governor’s race before the actual resolution to the 2018 Senate contest. Scott and a super PAC he helped create spent millions of dollars on the Senate race, but the fact that the wealthy governor wasn’t able to put the race away over the summer gave Democrats confidence that the incumbent could hold on. Trump narrowly carried Florida in 2016, and national Democrats tried tying Scott to the president as well. Scott was one of the first Republicans to endorse then-candidate Trump in 2016, and Trump urged the two-term governor to run for Senate. Scott had worked to distance himself from the president and the national Republican Party of late on issues such as gun control and offshore drilling, though he made appearances with Trump in the closing days, as well as swings to events organized by groups of president’s supporters, like one with “Bikers for Trump” at a bar in Fort Lauderdale. Scott, a former health care executive, contributed $64 million of his own money to this race, including a $12.5 million contribution in the final weeks of the race. He’s worth $232 million and previously self-funded his two winning gubernatorial campaigns. Scott got a head start in this race, while Democrats fretted that Nelson was slow to build up a campaign and wasn’t doing enough to reach Hispanic voters. The three-term senator didn’t air his first TV spot until late August. Meanwhile, Scott and his allies pummeled Nelson on the airwaves in English and Spanish, attacking him for being in Washington for too long. Scott also benefited from earned media attention, especially as hurricanes ravaged the coast. But spending from outside Democratic groups kept him from running away with the race over the summer. As they have against Republicans elsewhere in the country, Democrats attacked Scott for his opposition to the 2010 health care law. The environment played a bigger role in the debate in this race than in most federal contests this year. Both Scott and Nelson went after each other for the red tide and blue-green algae crises, with both parties accusing the other of not doing enough, at either the federal or state level, to address the problem. The campaign arms of the League of Conservation Voters and the Environmental Defense Fund also spent for Nelson. 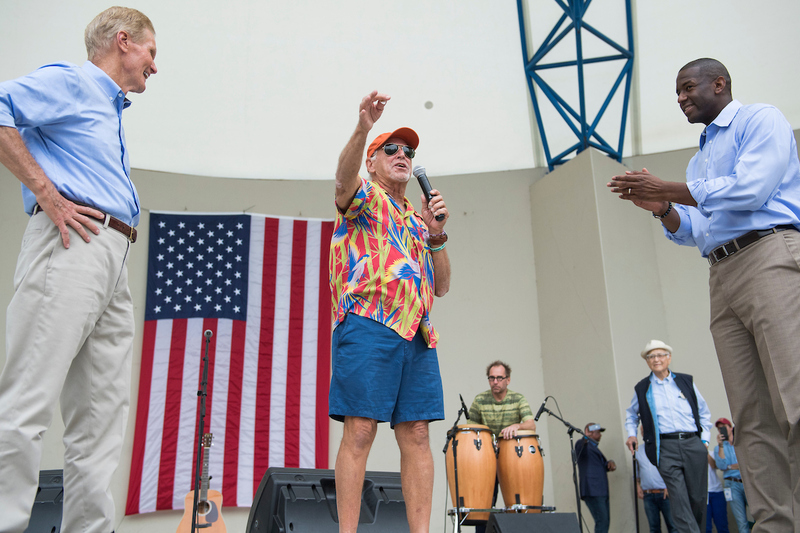 Even Jimmy Buffett changed the lyrics to Margaritaville for a Gillum and Nelson campaign event. “Some people say that there’s a red tide to blame/ but I know, it’s Rick Scott’s fault,” Buffett sang in West Palm Beach on the Saturday before the election. But none of that was enough to get Gillum to the governor’s mansion or the incumbent senator a fourth term in Washington.